Apple senior vice president of iOS software Scott Forstall is hailed in a new interview as a polarizing genius, and potentially what the company needs to continue its remarkable growth story in a post-Jobs era. In a comprehensive look at how the company's youngest senior executive rose through the ranks at Apple, Businessweek contrasts Forstall's many attributes with, what the magazine calls, his "polarizing" features. He is a man who has both won the loyalty and respect of his staff, and the ire of several current and former Apple executives. The magazine describes him, in many ways, as a mini-Steve Jobs. The magazine notes that while Forstall is brilliant at identifying what he wants, and how to get it, the senior VP is difficult to work with, and has allegedly prompted the departure of several high-ranking executives over the years. Similarly frustrated engineers from his iOS team have also quit, said one magazine source. "I once referred to Scott as Apple's chief a-hole," said former Apple software engineer Mike Lee. "And I don't mean it as a criticism. I meant it as a compliment. You could say the same thing about Steve Jobs." Businessweek argues that Forstall possesses the charisma, managerial skills, and tireless negotiating tactics that Apple needs to help lead Apple following the passing of its co-founder. Forstall grew up in a middle-class family in Kitsap County, Wash., the second of three boys born to a nurse and an engineer. He excelled scholastically, participating in various clubs and contests, and had a knack for computer programming. Forstall graduated co-valedictorian from his high school, boasting a perfect 4.0 GPA. His valedictorian counterpart is now his wife, Molly. After receiving an undergraduate degree from Stanford University in symbolic systems, an interdisciplinary department that combined classes in philosophy, linguistics and computer science, followed by a master's degree in computer science, Forstall joined Jobs' NeXT Computer. His job entailed work on the company's operating system, and led him to design user interfaces for the retooled Macintosh line when Apple bought NeXT in 1996. This was the year Jobs returned as interim CEO of Apple after being ousted in 1985 from the company he had co-founded in 1976. By 2000, Forstall was a leading designer of Aqua, the Mac UI that featured water-themed visuals such as translucent icons. Later he would manage the group of developers that created the Leopard version of the OS. A critical stage in Forstall's career came in 2005, when Apple and Jobs were in the process of creating the first iPhone. Jobs was faced with the dilemma of choosing which software would run on the future device, being either a Linux-based system from the team that built the iPod, or a stripped-down version of the Mac OS. Businessweek describes Jobs' choices as either shrinking the Mac, or enlarging the iPod. According to the magazine, Jobs preferred the former because it would give Apple a highly customizable mobile OS, able to be used in future products. In classic Jobs fashion, he pitted the two teams against each other, with Forstall leading a 15 member team in the Mac approach, against then-iPod chief Tony Fadell and his team. 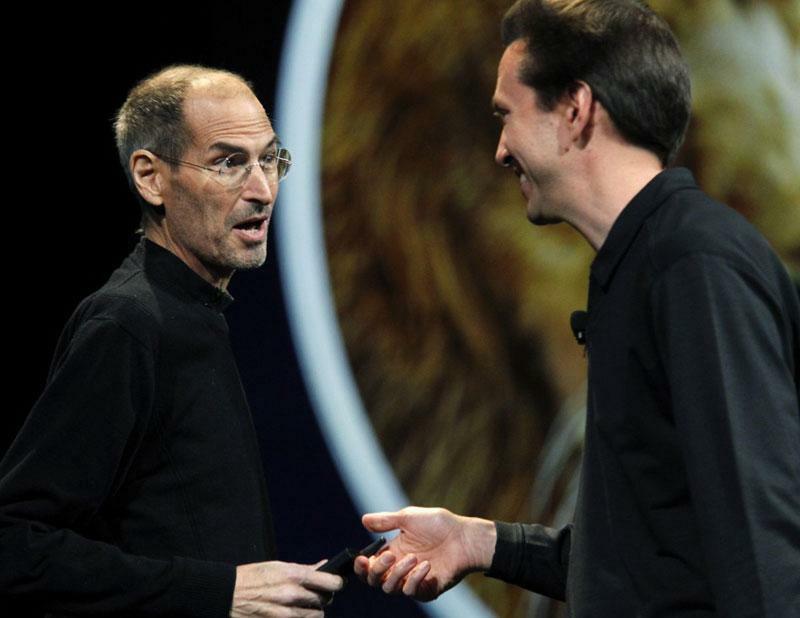 Inter-office politics flared as Forstall was reported to have stolen top talent from the opposing team, and refused to share early versions of what would become iOS. He religiously followed Jobs' obsession with secrecy, even among company departments. With his OS shipping on the first iPhone in 2007, and Apple's goal for software to be completely integrated with its hardware, Forstall's strength grew within the company. Because of Apple's mantra of seamless software and hardware co-existence, hardware engineers couldn't add new features without going through Forstall's engineers. Thus, if he didn't like the idea, it was vetoed. By 2008, when he was promoted to senior vice-president, Forstall had the reputation of making sure his accomplishments were noticed, blaming others for failures, reports Businessweek. According to the magazine, some former associates say Forstall routinely takes credit for collaborative successes, deflects blame for mistakes, and is "maddeningly political. " Though even critics are quick to point out that Forstall is a great troubleshooter, citing the introduction of an ecosystem for third-party developers to create apps for the iPhone. The device was initially closed and Jobs viewed the device as a standout, as it combined a phone with an iPod and a web-browser. The thought then was that Forstall's team would partner with market leaders such as Google to create apps built specifically for the device. When consumers began unlocking their iPhones to run unauthorized apps, though, Forstall oversaw the creation of a software developer's kit and what would become the App Store, so that Apple could leverage the new trend. He was first earnestly thrown into the public eye in June 2009, when he was tasked with delivering a large portion of a keynote during one of Jobs' medical leaves. Although not as charismatic as Jobs, he did prove to be capable of holding his own on stage. The 2010 iPhone 4 prototype fiasco forced Forstall into a corner, as he was responsible for persuading Jobs to allow the prototypes to be tested in public. To add to the serious breach of secrecy, the main reason behind Forstall's idea to let the phone out in the open turned out to be unsuccessful. The iPhone 4 dropped calls due to an alleged flaw with the software and antenna design, and turned into a target for customer complaints. Forstall survived that debacle and Apple has since given him authority over quality assurance and testing. The company has good reason to lay so much faith in the iOS chief, as over a quarter billion devices running his iOS have been sold to date. The devices account for 70 percent of Apple's revenues. It's also suggested by Businessweek that Apple may have more need for Forstall than he does for them. Over the past ten years, he sold about 237,000 shares worth over $42.5 million, according to regulatory filings. On the other hand, Apple needs Forstall's gravity in the development community to draw programmers toward iOS, and not competing platforms like Google's Android. He has control of the development tools and processes that make iOS so popular, and thus has the ear of many developers. In the end, Forstall is seen as an asset by many, though the magazine profiles him as a young Steve Jobs, "scorching the earth behind him while retaining a remarkable ability to come out ahead." Jobs and Forstall were close, remarks the magazine's sources, with Jobs taking pride in the young executive. Forstall may be Apple's best hope at preserving the legacy of Jobs, and it's suggested that perhaps Jobs saw that as well. At Apple's World Wide Developers Concerence in June, Jobs referred to Forstall's software as the "soul" of Apple's products. Later in the keynote, Forstall detailed the latest version of iOS, and when passing by the late CEO as he walked off stage, the audience could hear Jobs say, "good job."